Consider the case of 14-year-old Jimmie Radcliff, of Canton, Ohio. He’s an athletic kid who likes to wrestle and play football. When he complained of hip pain after a gym class in February, his aunt, Talaya Patterson, figured it was just a muscle strain. But the pain persisted. When he experienced light headedness at school on Monday, she took him to see the pediatrician. The pediatrician also thought something was up and recommended a visit to Dr. Troy Smurawa, a pediatric sports medicine physician at Akron Children’s Hospital. The blood test that Dr. Smurawa ordered indicated Jimmie had cancer. 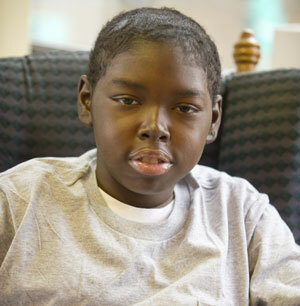 Jimmie was diagnosed with chronic myeloid leukemia, a rare form of leukemia usually found in adults. He underwent full body radiation, cranial radiation and chemotherapy, but nothing would keep the cancer at bay. The only option left was a bone marrow transplant. A search of the bone marrow registry turned up one match, but that person was disqualified during the testing phase. It is difficult for minority groups such as African Americans to find a match due to a low number of minority registrants. Luckily, the transplant team at Akron Children’s located two cord-blood, stem cell samples that matched up with Jimmie, one from Georgia and the other from France. Jimmie received his transplant in June and spent more than a month in the hospital recovering. On Oct. 1, Jimmie celebrated his 100th day after transplant, an important milestone for transplant recipients. His aunt said she realizes how lucky Jimmie was to find a match. A cheek swab is all it takes to get registered. Akron Children’s is hosting a bone marrow drive in Akron on Nov. 16 in the hospital’s atrium lobby, and on Nov. 18 at Akron Children’s Beeghly campus in Boardman. To join the registry, you must be between the ages of 18 and 60, be willing to donate to any patient in need, and meet the health guidelines.